I was proud to be appointed Chairwoman of the Assembly Legislative Commission on Science and Technology this year. 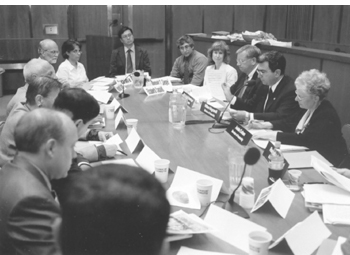 The Commission, created in 1979, is dedicated to providing the Legislature and the public with up-to-date information on technological and scientific issues facing our society. I am pleased to have this opportunity to update you on the work we have done on behalf of the citizens of New York State. This year, the Commission focused its work on alternative energy technologies and strengthening accountability for the State’s investment in research and development (R&D). As evidenced by ever increasing heating bills and rising prices at the pump, there is a growing need to further promote energy efficiency and R&D of alternative energy technologies. New York is poised to be a leader in advanced energy and environmental technology development, manufacturing and installation, all of which create jobs for New Yorkers. But to achieve these objectives, government must take the lead. I am working to advance legislation to encourage more research and development of alternative energy sources. To improve accountability, the Commission examined how to effectively measure the impact of the State’s significant investments in R&D at universities and other entities statewide. We have an obligation to let the public know how its money is spent. In order for the Commission to be the most effective, the concerns of New York State citizens must be heard and examined. With your help I can be a strong advocate for progressive public policy in the area of science and technology. Please feel free to contact me with concerns or suggestions at either my District or Albany office or contact the Commission staff directly at: (518) 455-5081, scitech@assembly.state.ny.us, or NYS Assembly Commission on Science and Technology, Agency Building 4, Empire State Plaza, Albany, NY 12248. Assemblywoman Cohen held a fact-finding hearing at Kingsborough Community College to explore how Brooklyn businesses can benefit from high technology. Assemblywoman Cohen moderates the discussion on Alternative Energy Technologies at Kingsborough Community College. 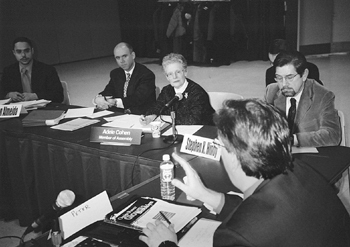 On March 11, 2005, the Commission along with the Task Force on University-Industry Cooperation held a Roundtable discussion with researchers, economic development officials, utility personnel, and private sector representatives on “Alternative Energy” at Kingsborough Community College in Brooklyn. Discussion focused on the differences and similarities between New York City and Upstate in terms of needs; public policy issues regarding alternative energy development and deployment; the importance of connecting energy policy with economic development; and how we can continue to encourage the use and development of alternative energy. Money to support the State’s renewable or alternative energy programs comes from a Systems Benefit Charge (SBC) levied on investor-owned utility companies and administered by New York State Energy Research and Development Authority (NYSERDA). NYSERDA’s programs are intended to develop both the wholesale and retail markets for alternative energy through support for research and development, demonstration projects, wind power plants, distributed generation, and green power marketing. Local users of renewable energy, Brooklyn Brewery and the New York Aquarium, participated in the Roundtable. They agreed that to facilitate growth of New York State’s renewable programs, our programs needed to become less cumbersome. The participants all agreed that more of an effort should be made to better publicize programs in the State and encourage new companies to start projects. Many consumers and businesses are unaware of what programs exist and how they can be accessed. It was also agreed that New York has much to offer as a center for the development of alternative energy in terms of research, manufacturing and use. Office of the State Comptroller (OSC) staff attending the Roundtable noted that their “Energizing the Future” report projected over 43,000 new jobs in the renewable energy industry by 2013. Others also cited potential growth of the renewable energy industry as a partial result of New York’s adoption of the Renewable Portfolio Standard or RPS (a requirement that a percentage of all electricity sold in the state must come from renewable energy technologies). New York State government could best assist this goal by encouraging more research in renewable energy technologies. Participants also recommended that the State should provide additional research and development funds to support alternative energy research projects, and make funds available to match federal awards that would spur research. Responding to concerns discussed during the roundtable about encouraging commercialization of new alternative energy technologies, the Commission developed legislative proposals introduced and adopted in the Assembly this year. Innovative Energy and Environmental Technology Development and Commercialization Grants (A.6758, Cohen). This measure would provide, within available appropriations, capital grants for up to $100,000 to qualified small businesses to help develop and commercialize new energy and environmental technologies in New York State. This measure passed the Assembly during the 2005 session. Small Business Energy Loan Program (A.8352, Weprin). This bill, which Committee Chair Adele Cohen co-sponsors, seeks to encourage the adoption and installation of more efficiency and alternative energy technologies by small businesses. This measure would provide zero- and low-interest loans or loan interest rate reductions for energy improvement projects to stimulate the growth and development of small businesses and jobs. This bill passed the Assembly during the 2005 session. The Commission will continue to focus on Alternative Energy issues and is planning another roundtable on the subject in Syracuse later this year. We will be developing additional legislative initiatives to encourage further development and deployment of these technologies. 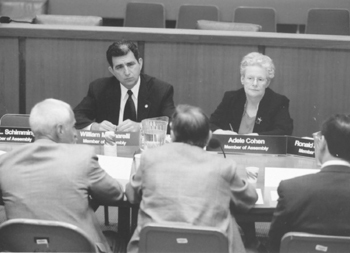 Assemblywoman Adele Cohen and Assemblymen William Magnarelli and Robin Schimminger listen to participants at the R&D Assessment Roundtable on June 14th in Albany. New York State is home to many world-class research institutions and the State has invested hundreds of millions of dollars in research and development (R&D) at our colleges and universities to stimulate economic growth, and ensure global competitiveness. We expect these investments to spur discoveries leading to the development of new technologies, the formation of new companies, and the expansion of existing firms creating jobs for New Yorkers. Much of the State’s investment focuses on institutions engaging in cooperative agreements with public and private entities intended to foster development and eventual commercialization of new products and processes. However, an assessment of the effectiveness of public investments in R&D has not been routinely incorporated in State policy, nor has a standard set of evaluative metrics been identified. Some important steps to improve accountability were taken in the SFY 2005-2006 budget when we replaced the New York State Office of Science, Technology and Academic Research (NYSTAR ) with the new NYS Foundation for Science, Technology and Innovation. The new foundation, governed by a board which includes representation from the private sector, government and higher education, will administer many of the State’s R&D programs. With new administrative structure, funds will also be distributed to Regional Partnerships comprised of local economic development organizations, and academic research institutions. These new Partnerships will allocate funds to help commercialize innovative products and processes for emerging technology sectors, including biotechnology, nanotechnology, bioinformatics, software design, innovative energy efficiencies and environmental technologies, as well as other related purposes to spur regional economic growth. This new partnership includes much-needed reporting requirements at the State and the regional levels. The reporting requirements are fully spelled out in budget language and will include information on how public dollars are being spent as well as information on the outcomes of this investment. These include the number of full-time public, private, and nonprofit sector New York jobs created as a direct result of the state’s investment; the number of new businesses created; the number of patents awarded to the college or university and the income derived from the sale or license of intellectual property. On June 14th, the Commission co-sponsored, along with the Committees on Higher Education and Economic Development, Job Creation and Commerce, the Task Force on University-Industry Cooperation and the Subcommittee on Manufacturing, a Roundtable discussion in Albany on how to effectively assess the impact of the State’s investment in R&D. Attendees represented New York State public and private institutions of higher education, private industry and nonprofit research organizations. The Roundtable discussion focused on significant questions related to evaluation of investment choices and how the results of those investments are measured. In a very spirited and provocative exchange, a wide range of issues relating to accountability were discussed. This included the complexity and difficulty of measuring the economic impact of R&D investments, the importance of emphasizing social returns on investments from the public perspective, and the need to incorporate evaluation/planning in initial project selection. Discussion focused on process issues, what sorts of measures should be used, the impact of current State investments, and how they are/should be assessed. Several participants observed that evaluation criteria and expectations most logically should be designated at the initiation of R&D investments. Utilizing external third party evaluators might be the most effective, albeit expensive, approach. The discussion reflected that measures can be identified, but deciding on which to use is difficult. For example, while there may be the desire to try to make a direct connection between investment and jobs created, using the number of new jobs created may not be the best indicator of success. It was noted that R&D investment leading to the creation/expansion of a company will generate jobs and economic activity outside of the company; therefore, one should look at the number of new enterprises formed or other impacts. A great difficulty in looking at the impact of public R&D investment comes from the tension between the frequently conflicting goals of encouraging high-tech industry and providing a stimulus to economically depressed regions. The Roundtable concluded with a commitment to continue the dialogue on R&D funding assessment and to move forward on this important issue of accountability. Research and Development Accountability Act of 2005 (A.6633-a, Magnarelli). 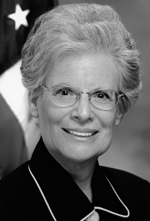 The Research and Development Accountability Act of 2005, which Assemblywoman Cohen co-sponsors, continues an effort started in this year’s State budget, that would add new accountability language for an additional number of State-funded R&D programs at our colleges and universities. This bill would extend similar reporting requirements including the number of jobs and new businesses created and how State money is utilized at the five Centers of Excellence in which hundreds of millions of dollars have been invested to date. The bill unanimously passed the Assembly on June 8th; however, the Senate companion bill (S.5026-a) did not reach a floor vote before the close of session. In the coming year, the Commission will continue to work in partnership with the Task Force on University-Industry Cooperation to further examine how the effectiveness of State’s investment in R&D can be assessed. 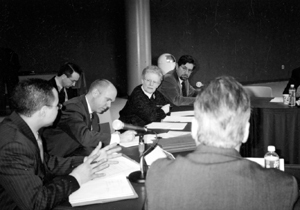 The Commission expects to hold further roundtables or hearings on this important topic as well as continue its research efforts into the policies and activities at research institutions throughout the State in order to assure that NYS citizens enjoy increased economic opportunities and improvements in their quality of life as a result of State investments in R&D.